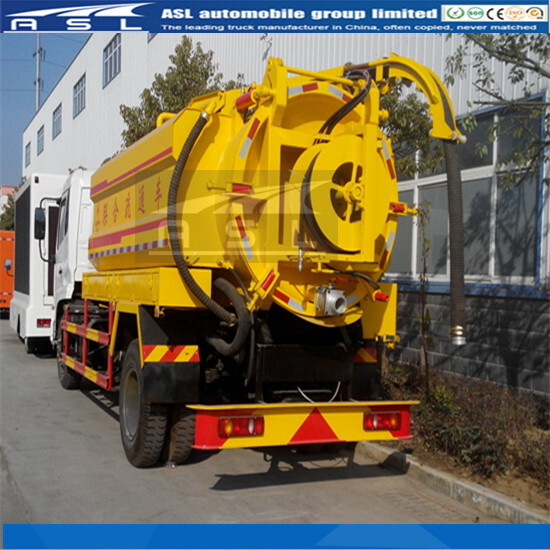 6wheels Canal Jetting And Sewage Trucks are a kind of special vehicle developed by ASL Environmental & Sanitation Division. 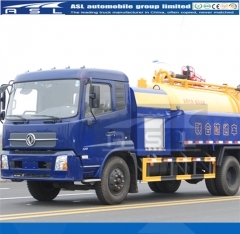 It is adopted mainly for sewage suction and cleaning operations of city sewers and canals as well as the pipe cleaning for the field of oil refining, iron and steel, chemical industry, real estate management and sanitation. It is applied also to pipe cleaning, waste water and sediment pumping, loading and discharging operations in oil refining, iron and steel, chemicals, housing, sanitation and other industries. 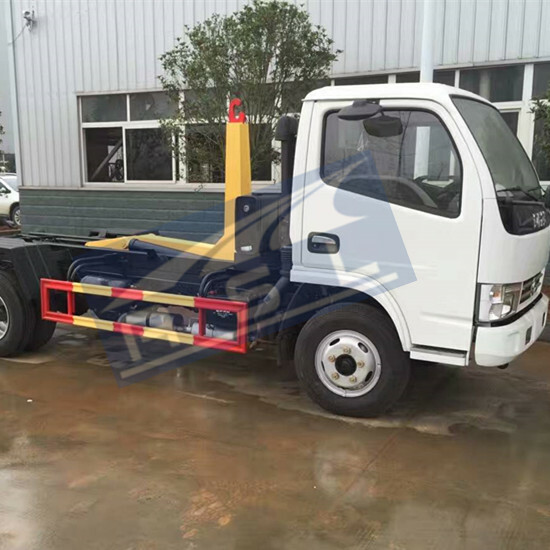 The truck uses chassis modification of stereotypes vehicle, and main components and parts will purchased globally with excellent performances and reliable operations. 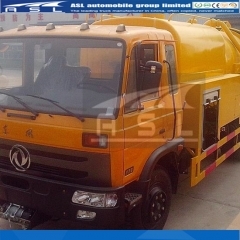 1: Having dredge，suction sewage, cleaning-up and other functions, the vehicle equal to three others. 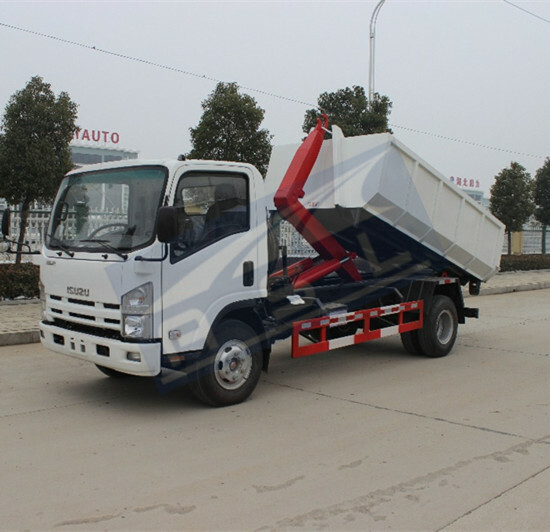 2: Chassis: Dongfeng 8-ton Class II vehicle chassis, ISDe210 40 engine, 155 kW power, 2500 r/min rated speed, and Euro Ⅳ emission standard. 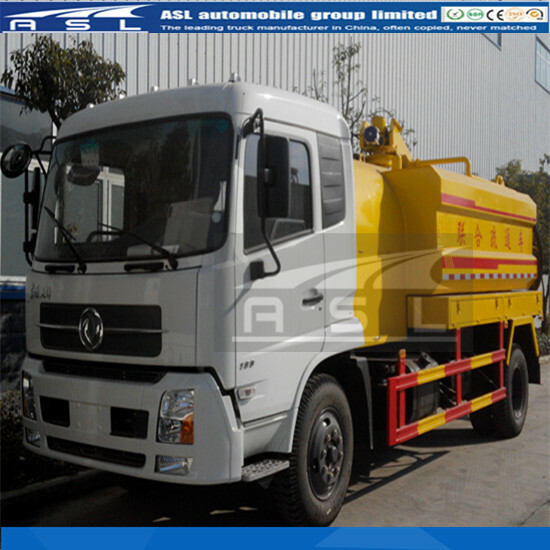 3: Transfer case: Germany OMSI PFT-PC4/3000 transfer case obtaining the force from chassis engine to transmit to vacuum pump, high pressure water pump respectively so as to realize multi-point large-power take-off. This belongs to a key technology. 4: Vacuum pump: Limit vacuum degree: 33 mbar; The maximum exhaust amount: 1400 m3/h; The maximum operating speed: 1300 r/min. Water ring vacuum pump: it is made in China with Siemens technology. 5: High-pressure water pump: Rated pressure: 19MPa, rated flow: 212 L/min; the maximum speed: 1700 r/min; high pressure piston pump made in Italy. The pump has excellent performance on China Sewer Cleaning Combine Trucks. 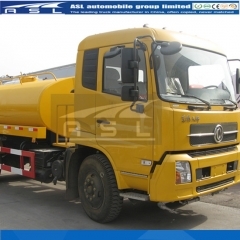 6: Sewage tank: It is made of 8 mm boiler steel plate. It is cylindrical. Back cover can open and close automatically. 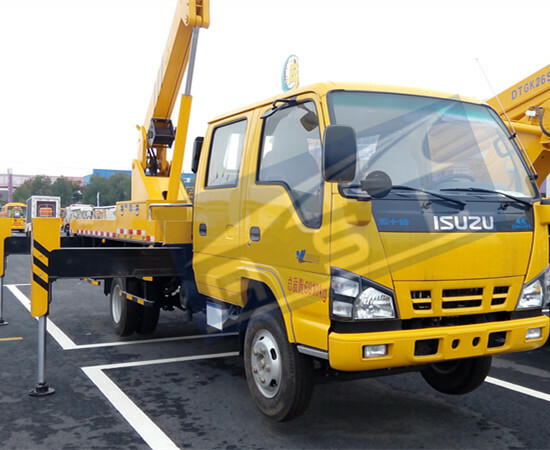 It is equipped with a high level alarm protection device. 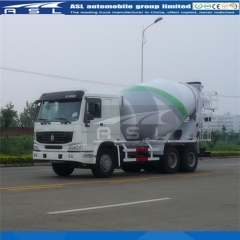 Its total volume is 5.5m3, and its effective volume is 4.5m3. 7: Clean water tank: It is composed of three full stainless steel water tanks that pipelines are connected thoroughly. It is set internally with anti-wave boards and equipped with a low level alarm protection device. Its total capacity is 4.5 m3. 8: Sewage suction tube: PVC steel wire reinforced hose or steel wire braided hose with rotating boom can be rotated horizontally to 230°. Its vertical amplitude is -27°~+53°. 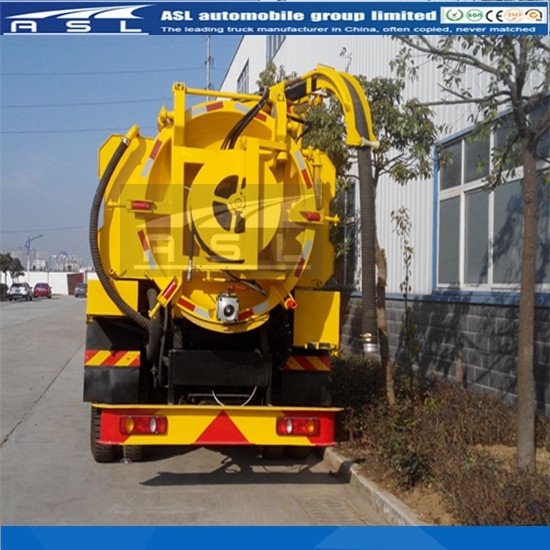 Its telescopic length may be up to 1.3 m. Three 1.8 m extension pipes can be connected with sewage suction tubes. 9: Pipe reel: Hydraulically driven pipe reel with forward and reversal rotations as well as step-less speed regulating. It is installed on the rear cover of sewage tank. 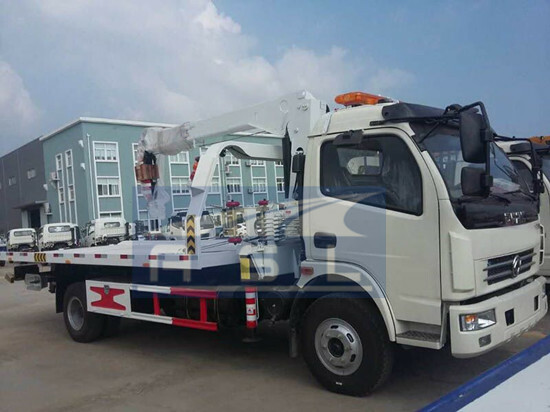 The length of dedicated hose for winding and storing DN25 shall not be less than 100 m.
10: Dedicated hose: Dedicated sewer dredging and cleaning hose of originally imported ND25 can resistant high pressure with light weight, small frictional resistance, and strong scratch resistance. 11: The length of tube with standard configuration shall be 80m. 12: Clean water pipe reel: Pull out the water pipe manually, and retract it automatically. 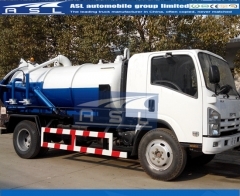 It is equipped with originally imported hand-held spray gun for cleaning the vehicle and operating sites. 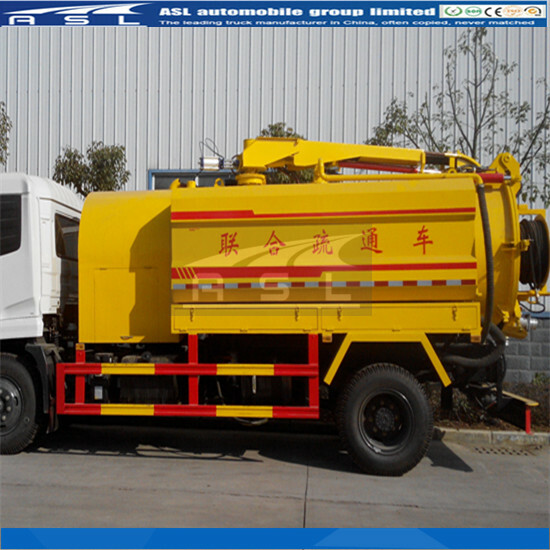 The length of hose is 20 m equipped on 8000L Combined Suction And Jetting Trucks. 13: Nozzle: Originally imported 1” nozzle. It shall have 3 nozzles in standard configuration. 14: Rhombus nozzle: It may jet forward and backward at the same time. It is suitable for any completely blocked pipe. 15: Mushroom-shaped nozzle: The nozzle may be arranged with two kinds of angle. It can generate a greater thrust force for any pipe with grease. 16: Bomb-shaped nozzle: There is an angle of 15° or 30° between nozzle and nozzle axis. It may be used under normal circumstances. 17: Operating control device: The forward, backward and speed adjustment of nozzle and hose may be controlled manually. All other controls can be controlled electronically. 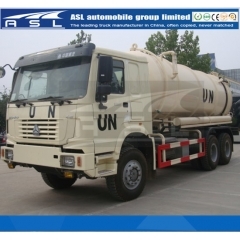 Besides of electronic control, all including sewage suction tube rotating boom rotation, variable amplitude, telescopic as well as opening and closing the back cover of sewage tank on China Sinotruk HOWO Combined Vehicles and tipping reset shall also be equipped with a wireless remote control.